Ballymena's David Cushley in action with Glentoran's Stephen McAlorum. 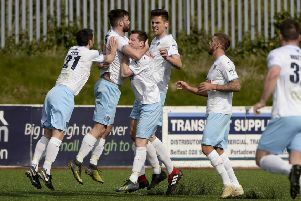 Ciaran Caldwell’s first half goal ensured that Glentoran extended their unbeaten run in all competitions to six games by beating Ballymena United at The Showgrounds. Caldwell smashed the ball past Dwayne Nelson on 38 minutes after meeting Jim O’Hanlon’s pinpoint left-wing cross. Nelson saved from Curtis Allen early on while David Cushley curled an effort off the bar and Elliott Morris pushed an Allan Jenkins drive round the post. The Glens have won three and drawn two of their last five league fixtures. Director of Football Roy Coyle has yet to taste defeat during his spell as interim boss since the sacking of Eddie Patterson, while the Oval outfit extend a fine run, which sees them unbeaten at the Warden Street Showgrounds since 2007.